Insider-Trading Ban Passes Congress, But Some See Missed Opportunity : It's All Politics The Senate passed a bill Thursday to explicitly ban insider trading by members of Congress and the executive branch. But the legislation, known as the STOCK Act, is quite a bit weaker than earlier versions. 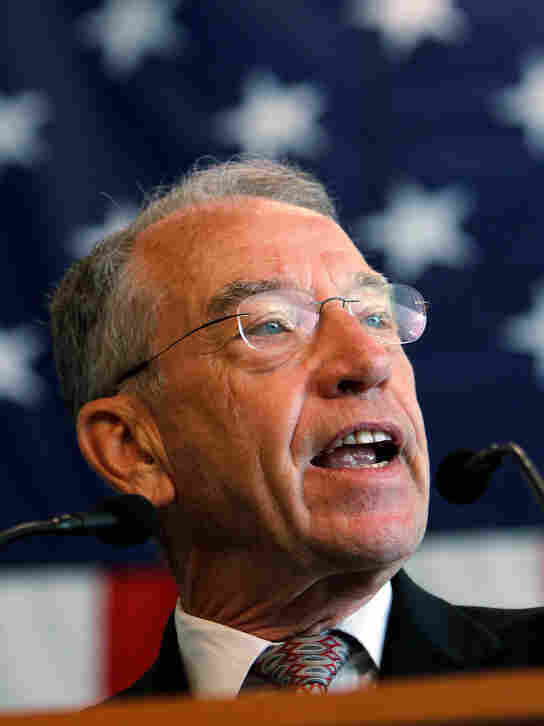 Sen. Chuck Grassley, R-Iowa, shown in August 2011, criticized the STOCK Act that passed Thursday, saying it didn't go far enough. The Senate passed a bill Thursday to explicitly ban insider trading by members of Congress and the executive branch, and that means the Stop Trading on Congressional Knowledge Act is headed to the president's desk. But this STOCK Act is quite a bit weaker than earlier versions. The STOCK Act has been on a glide path ever since an explosive 60 Minutes story last fall highlighted the issue of members of Congress apparently profiting on nonpublic information. "I think the passage of this act is the most significant congressional ethics reform legislation to pass Congress in at least five years," says Sen. Joe Lieberman, the Connecticut independent who heads the committee that guided the bill through the Senate. "I mean, here's a case where a problem was identified that cut directly to the public's faith in their elected representatives," says Lieberman. "We dealt with it quickly and on a bipartisan basis in both houses of Congress." The STOCK Act passed the Senate with unanimous consent. But Iowa Republican Chuck Grassley wasn't celebrating. He was unhappy with the bill, not because it was too strong, but because it didn't go far enough. "This is bipartisanship, but it's not the kind of bipartisanship cooperation that this nation deserves," Grassley says. He's livid that instead of insisting on a stronger version of the bill, the Senate took up a watered-down STOCK Act sent over by the House. What was missing is a provision to require people working in the political intelligence industry to register, much like lobbyists. Political intelligence firms gather information about happenings in Congress that could move the markets and then sell it to hedge funds and other deep-pocketed investors. "The leadership of both parties, the majority in the House and the majority in the Senate went behind closed doors and made that provision just magically disappear," Grassley said Thursday on the Senate floor. Grassley says this is a victory for Wall Street interests. This bill does require members of Congress, their staffs and those in the executive branch to disclose stock transactions within 30 days, and to do so electronically. Craig Holman, a lobbyist for Public Citizen, says that is a huge improvement over the current once-a-year paper-filing system. But "it's just the minimum of what Congress has to do to address congressional insider trading," says Holman. "Still good. But what a missed opportunity." A missed opportunity, he says, to include things like the political intelligence provision, and another one that was removed that would have made it easier to prosecute public corruption. Even so, one of the bill's longtime advocates is describing passage of the STOCK Act, even this weaker version, as a "major step forward." "I'm delighted it's passing. I really am," says Rep. Louise Slaughter, D-N.Y., who has been working on the STOCK Act for six years. "One thing I know about being in a legislature is that you're not really defeated until you quit." And she's not quitting. Slaughter and a colleague have already introduced a new bill aimed at the political intelligence industry. She just hopes it doesn't take another six years. The audio of this story, as well as an earlier Web version, incorrectly had Iowa Republican Chuck Grassley voting against the STOCK Act. In fact, the bill passed with unanimous consent. Grassley was one of three senators to vote against a cloture motion that ended debate on the bill.